The City of Sand Springs, Oklahoma is looking forward to spring 2016 when they will be opening their first two Splashpads. Construction is currently underway on both sides of town for the River City Park Splashpad and the Pratt Civitan Park Splashpad. Sand Springs Mayor Mike Burdge said “There’s been a push to build water recreation areas in the City of the last decade.” Funding was made possible when voters approved the 2014 GO Bond funding and through a generous donation by Sand Springs Rotary Club. Located at West 44th and Walnut Creek Drive, Pratt Civitan Park Splashpad features 29 ground sprays and 7 above ground features. Features include a Bamboo dumping flower, Aqua Dome, a Fumbling Five which has five dumping buckets, three raining Ombrellos and a Waterbug for the little ones. Ground sprays include a Water Tunnel, Jet Streams, Directional Water Jets and an interactive Team Spray that shoots streams of water high into the air when kids work together and step on the ground sprays. 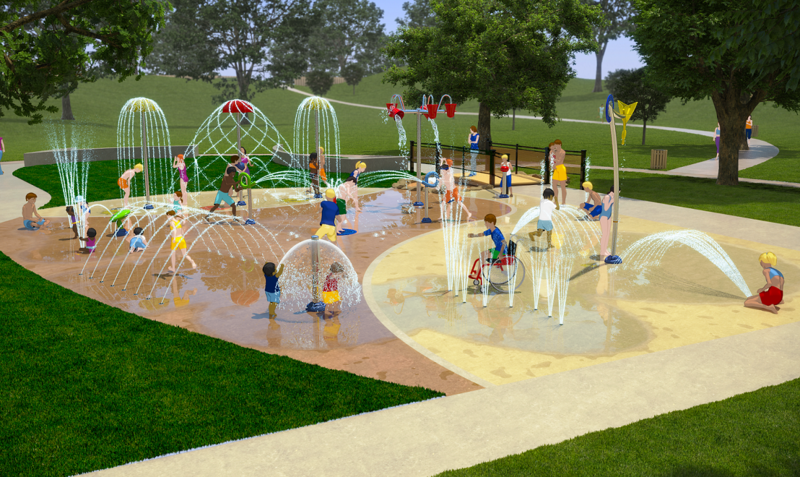 The Splashpad also includes three Safeswap Ground Sprays which can later be changed to above ground features as additional funds become available. The second Splashpad is being constructed at River City Park. The Sand Springs Rotary Club donated $60,000 to the Sand Springs Park Friends nonprofit to enhance River City Park. Thanks to this donation, River City Park will include a giant Super Splash water feature. The Super Splash includes a giant bucket which has been designed to look like an old wooden bucket and will include the Rotary Club logo on it. 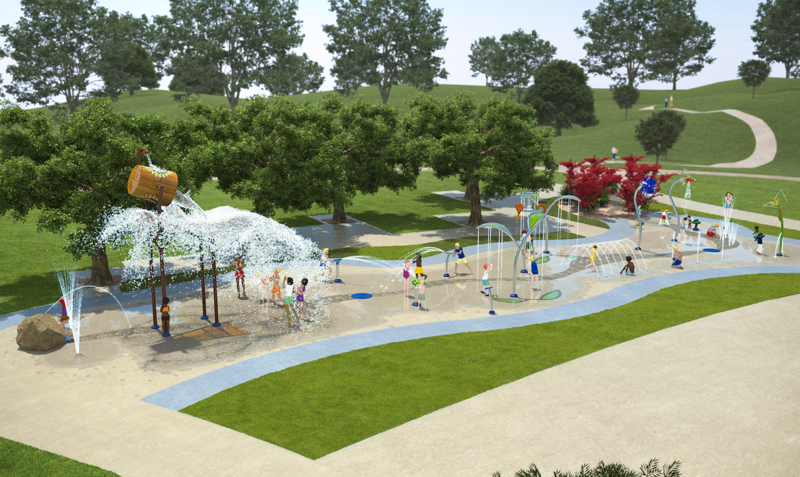 This Splashpad will have a very unique river look and feature organic looking water features. It includes 22 ground sprays and 12 above ground features. Features include several dumping Flowers, a flower Bloom which creates a spiraling water effect, raining Leaves, three Water Cannons, and a Frog and Snail for the little ones. Ground sprays include Ground Geysers, Water Jets, Jet Streams, a Water Tunnel and Team Spray. Power Play worked with Land Plan Consultants to create these unique Splashpads for the City of Sand Springs. We are all looking forward to their grand opening in the Spring.